Have you heard of My 1st Years? The company was founded in 2010 when it was realised there was a gap in the market for personalised unique baby gifts that were also affordable. They launched with the aim of becoming the number one baby personalisation brand. I discovered them last year and they have some gorgeous items including Personalised baby clothes and great personalised baby gifts suitable for new baby, christenings, 1st birthdays or just something special. I already have my eye on a few other items they sell such as this lovely My 1st photo album personalised with your little ones name and date of birth - for £18 I think it would make a lovely new baby present, christening gift or just a little treat for yourself. I am tempted to get one for Oliver and one for Isabelle so that they both have one. Recently Prince George was seen in a blue jumper with his name on the front, since then lots more babies have been wearing items with their own name! Little trend setter already. 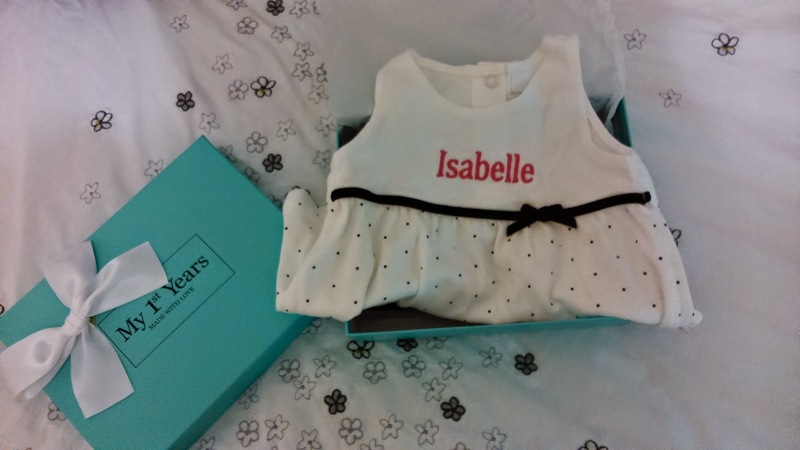 My 1st years doesnt just stop at jumpers though, theres shoes, dresses, hooded towels, gifts big and small and they've very kindly sent me a gorgeous outfit for Isabelle to review! I love when items arrive beautifully packaged, I do judge the company by its presentation of items especially when they're 'gifts' and My 1st Years offers free luxury gift box with every order, as well as this theres free delivery on orders over £30! (I love free postage). 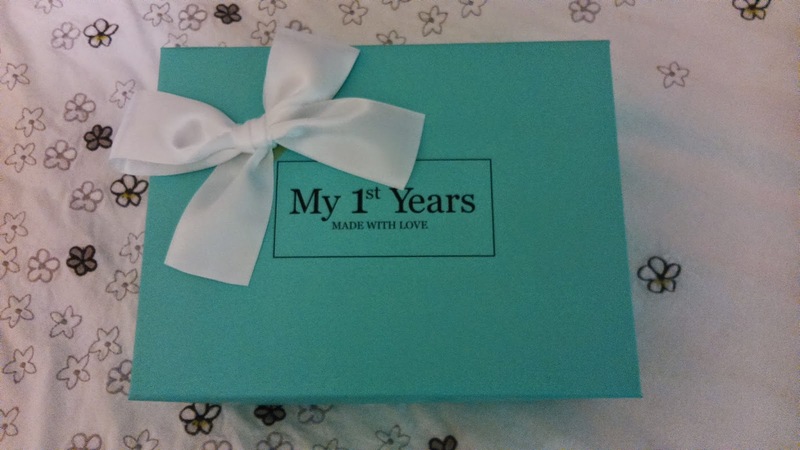 I always keep pretty boxes - this one is ideal to keep first little bits in as it says 'My 1st Years' on the front I am going to use it for exactly that - her name tags from hospital, hair from her first haircut and first tooth... little things like that, that I want to keep hold of. I wish I had another one the same size for Oliver, I like to try to make it so they both have the same... does anyone else do that? Inside the box I found this cute little outfit, you can choose the font and the color of the writing as well as obviously, your babies name (up to 12 characters)... This outfit is available in 0-3months, 3-6 months, 6-12 months and 12-18 months and costs £25. Its a set including a dress, leggings and a hair band, thats personalised with her name. 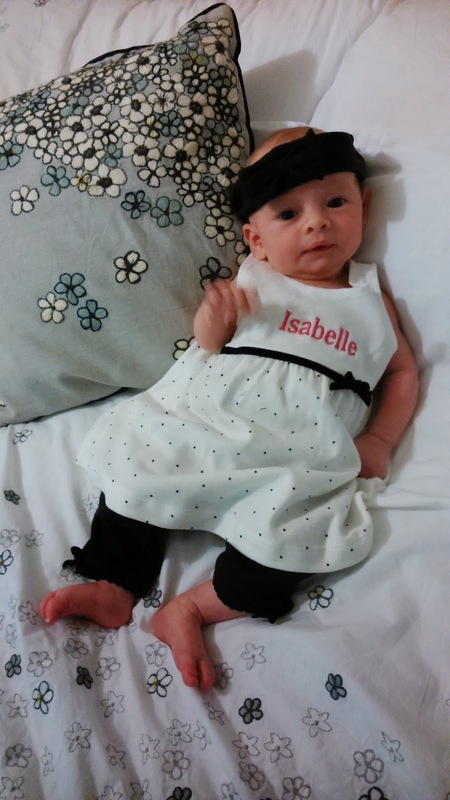 see Isabelle's outfit here! Isabelle wearing her new outfit, she was babbling away as I took the photo with arms flying about everywhere... this little lady is barely still! It's in age 0-3 months and it's still a little bit big on her as shes only just outgrown upto 1 month size but it's going to be ideal for warmer weather for her or to pop a cardigan over. I think I will leave the hair band off though as it's too big for her head! But I'll keep it to wear in future with another outfit as I really like little hair bands on her. (saying that, her head might grow a little by the time the rest of the outfit fits her). So what do you think of Isabelle's new outfit? It's adorable isn't it? (And she is too.. biased I know, hehe). Feeling jealous of Isabelle's new outfit? Well, My 1st Years have also decided to hold a giveaway with me to give someone the chance to win £25 to spend on/towards a purchase of your choice so you can buy your little one an outfit like Isabelle, maybe the boys version if you have a little boy or something else from their website! Competition open to the UK only. I would buy the Organic Natures Purest Rag Doll! Every little girl should have a ragdoll! Thank you for the lovely giveaway! How gorgeous does she look in her lovely dress!